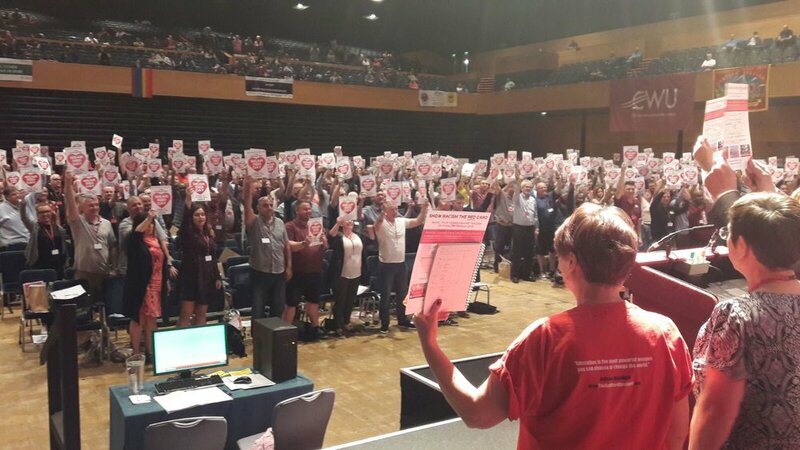 On Sunday 22nd April, Show Racism the Red Card (SRtRC) Vice President, Christine Blower, attended the Communication Workers Union (CWU) annual conference in Bournemouth to address delegates on the work of Show Racism the Red Card. "On Sunday April 22nd, I was pleased to represent Show Racism the Red Card at the CWU annual conference in Bournemouth. At present we have no funding from CWU but they are a union that takes anti-racism seriously, so I was pleased to have 15 minutes to address a plenary session. Coming as it did in the midst of the Windrush scandal and on the anniversary of the vicious racist murder of Stephen Lawrence there was plenty to say. I talked about the school competition and encouraged any parents, grandparents, carer or school governors to get their school to take part next year. I showed one of the film's that had previously been a winner in the competition. Of course a big ask was for money, in particular in connection with Wear Red Day, an easy ask for posties but of course CWU organises many other types of workers. After my intervention there was a motion on the agenda calling on the union to support Show Racism the Red Card in a variety of ways. Encourage fundraising for Show Racism the Red Card which will be used to facilitate the delivery of anti-racism education for young people & adults throughout England and Wales. I have every confidence that the photo showing delegates holding up the West Red Day cards will be used to good effect in CWU. I'm sure we will have significant engagement from them going forward."